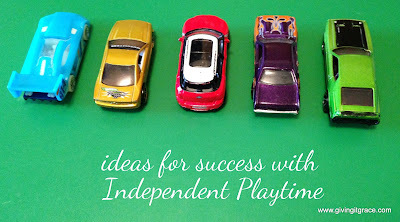 Today I'm sharing some ideas for success with Independent Play (below), and Carrie from Wiley Adventures is over on her blog talking about some great ideas for sensory play at home. Enjoy! 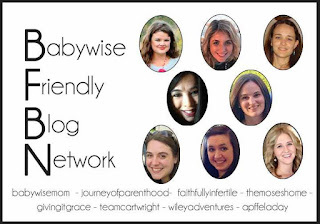 Independent Play (IP) was something I had not heard about until I read the Babywise book series. IP is basically when the child plays by themselves for a determined amount of time, and it looks different at different ages and stages . While it's great when a child randomly wanders into their room to play alone for a little while, IP is something that happens daily and is in a set place for a set amount of time. The benefit of doing this is two-fold: it gives mom or dad a break during the day without having to plunk the child down in front of the TV, and it gives the child a chance to develop their abilities to entertain themselves with just a few toys or activities at hand (a lost art in the digital age, I fear...). My now-2-year old son really struggled to get the hang of IP. I think his struggle was a combination of things: I was unsure of how to implement it when he was younger, we lived in a small condo so space was an issue, and his personality type. We moved houses when he was around 12 months and I tried again and again over the course of 6 months. Finally, around 18 months he finally started to show progress with it. Now - at 28 months - he looks forward to 60 minutes of IP every morning. He does his IP right after dad leaves for work while my newborn is still napping which means I get an hour to myself each morning to get dressed, tidy up, and read my Bible before my day really starts. timing: my son does his in the morning after dad leaves for work. He goes up to his room to wave from the window and then we transition right into IP. Some do it late in the day when toddlers tend to get fussy right around time for mom to make dinner while everyone is impatiently waiting for dad to get home. location: I tried forever to get my toddler to do IP in his open room. Turns out the room was too big for him to be left alone in, and so he does IP in his crib. I ask him every so often if he wants to do IP in his room and he says no. So crib it is. Not quite sure how I'll handle that once we transition his crib to a bed...but something tells me with his personality type he'll just still stay on his bed for IP. I know some who do it in a pack n' play in the living room or play room. involvement: we got a kitchen timer and we let him push the button on the timer to signal the start of IP. I then leave the room where I am out of sight and out of mind. When the timer goes off, I return to the room with it still beeping. This was really helpful early on when he would cry toward the end. length: we started with 10 minutes, and worked our way up from there. music/lights: play with this to figure out what your kid likes. My toddler doesn't like music anymore because (I think) it bothers him when he's trying to "read". toys: the GAME-CHANGER for us was purchasing some new toys that are only accessible during IP. I keep them up high in his closet and he picks out 1 toy and then a pile of books from his book bin each morning. This car carrier and this helicopter really keep his attention well.. Over time we added a series of Little People scenes into the rotation as they also hold his attention well. His favorite IP books are anything in the Richard Scary collection. I really believe that it was getting the right toys and books to hold his attention that made all the difference for him. If you're feeling stuck at square one with IP - keep going! Keep trying. Try new things. Don't give up. It's worth fighting for, for your toddler's sake and for your sake as well. Update: a few weeks after I wrote this post he started telling me "no room time" in the mornings. I took that as a sign he was getting bored in his crib. So I asked him again if he wanted to do room time in his open room and he said "yes". So we went over the rules and then I did everything the same: got out some special room time toys, set the timer, and left the room. He had said he wanted this door closed but fussed right after I left the room so I came back and opened his door but shut his child gate. He was ok with that. About 10 minutes in he came to his gate to tell me he had pooped, so I changed his diaper and then put him back in room time until his timer went off. It went as smoothly as I could have ever hoped for! Do you think it is okay to split independent playtime. Say 20-30 mins in morning and same again in the afternoon? Or do you think it would be better to build to one hour just once a day. Also my toddlers go to preschool for three mornings week, do you think I could still do IP in the afternoon or just do it in the mornings they are not at preschool? Hi! Absolutely yes on splitting the IP between morning and afternoon - especially if that works well with the rest of your family's schedule. As for the preschool days, I would attempt to do a short IP in the afternoon. The great thing about IP is you can really make it work however you need it to to best fit the needs of your child and your family.